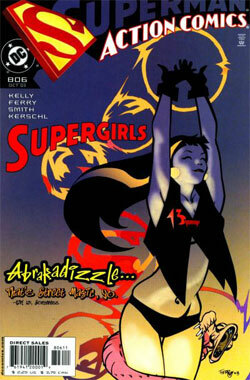 Traci Thirteen, also known as Girl 13, talks on the phone to someone about Metropolis, meeting Superboy, and finding a job. Later, sometime, she hears a few guys arguing over sports. She wiggles her fingers and they love each other. Superman crashes through a few buildings and lands at her feet. He has a weapon sticking out of his chest. Girl 13 utters a few words, and a WHOOM breaks her concentration. She breaks through the ground, taking Superman and herself into the subway. Meanwhile, Lana Lang buys a condominium on the middle of Metropolis. Lois drops in, only to find that Lana has decided to leave Pete. She tells Lois to tell no one. In the Steelworks, Natasha and Kelex talk about Steel's absence. Natasha admires her uncle's hammer, lying on the ground unused. She touches it, and it responds to her DNA, allowing her to pick it up. Kelex assures her that this is not a joke. Clark tells Lois, in bed, that he shared a kiss with Lana, and that he is sorry. Lois says that it's fine. But then, either alone or later, or in another room, or right in front of Clark (reviewer's note: it's not very clear) she says that it would be wrong to print the divorce from Pete. She then says that with the apartment, the politics, and Clark's friendship unraveling...(elipses part of her speech/thought pattern) she says, "Keep the 'Understanding Wife of the Year' Award this time, fellas. I'm allowed one." Lana tells someone on the phone to find who leaked that she was in town to Lois Lane and have them run out of town on a rail. She then laments that Clark Kent married such a raging witch. Girl 13 shows up at Lana's, thinking that she's Superman's girlfriend from the Lost Hearts incident, and starts asking her for nutmeg and candles. Natasha, meanwhile, finds a secret area where Steel has created a way for Natasha to be safe wielding the power of Steel, provided she does not heed his advice and decides to take up the mantle of a superhero. Girl 13 tells Lana she no longer has a rat in her pantry. Lana suggests calling the JLA, but Girl 13 tells her that it will bring back the creature that did Superman so bad, so she doesn't. Superman, barely conscious, remembers what happened. A group of Triad ninjas holding a woman hostage by garrote tell Superman to back off. Superman destroys the garrote and takes the ninjas out. A spectral form comes up behind Superman and stabs him, per his condition at the beginning of the issue. He thinks it is Byakko, but it is actually Gaki, a self-proclaimed hungry ghost. Superman, meanwhile, is not doing very well. Girl 13 admits that maybe they should call someone. Outside, a giant female Steel-looking robot tells them to step away from Superman. Story - 1: Let's start with some phrases from my own summary. Yes, folks, those read as confusing to you as they did in this issue to me. Did Lois decide to rat out what is essentially a close family friend with no reason other than the fact that she kissed Clark? Sounds out of character for Lois to me. Regardless, supposing that she did do this...why would she? What would it serve? Petty revenge? Lois was once a strong woman with character, integrity, and a devotion to her husband PRIMARY, not secondary to the story. What happened to her? Well, let's see. The Eddie Berganza run. Who I still have not heard back from with regards to my questions about Adventures of Superman #618. That's fine. I have some further questions. If we have characters that are so fascinating, have such a rich history, and are so well-loved, like, say, Lois, why change them? It's a rare enough thing that you actually USE a supporting character in these books save Jimmy these days...why make the ones slightly focusing on Lois turn her out of character and into a "raging witch" as Lana so adequately put it? And I'll be getting to Lana being out of character in just a second. And why, when we're not focusing on tearing down what's been good about our favorite characters, do we focus on characters no one gives a rip about? I am no pollster, but I do have a pulse on the fans, being one myself and communicating through email with a number of readers, positive and negative, and NO ONE has asked me, WHEN, oh WHEN can we see some more Gunshin, Byakko, Girl 13 and the Triad ninjas. I do, however, get TONS of email asking me, like I had some responsibility in the issue, why we are not seeing fan favorites who work well and are rich when done right, even though they've been around forever (see Loeb's new Metallo for a prime example). Where's the Toyman, Neal? Where's Cyborg and Doomsday? What happened to Perry White's son? What happened to Perry White? Where is Ron Troupe? Bizarro? Whups! Looks like in the middle of being humble, small town girl Lana ISN'T (a raging B@*% who screams into phones to have people run out of town on a rail, who doesn't want, what, one of her FRIENDS to be allowed to know where she is), she forgot the little fact that she had a CHILD which Superman went to GREAT PAINS to save, so great, in fact, that she named it after him? Little Clark Ross, from the Doomsday Wars? He's probably in the orphanage with the child of Ron Troupe and Lucy Lane. Funny how we haven't seen Lucy since the Imperiex War. I guess she was just in the tank with old Sam Lane, right? Wait a second! What am I whining about! Wait a mizzie! Hold the phizzy! We have GIRL 13! Doezzie thou detectest my sarcazzie? And look! What am I wanting to complain about known and loved characters, when we have good old TRASH TALKING EBONICS KELEX! And why should I complain about the loss of a great character like STEEL when we have his flaky and absent minded neice to take his place as a giant, automaton robot who tries to pull people helping Superman away from him? Especially when they have the situation so well in hand with a dead rat, candles, and NUTMEG! For shizzle! Here's something that only the most quick and hip will catch. Eddizle, thisizle izzle nizzle the wayzle weizzle wantizzle ourizzle Supermizzle. Get mezzle? My open challenge from Adventures #618 still stands. This issue only renews my thinking that things are down the tubes in every respect save the outside series, the Birthright, Metropolis, and Superman/Batman. I believe that I could write better, or that at the very least, we, as fans, could help inform the Super-teams as to a good direction for Superman to go, back to roots, back to form, character, and stories that makes sense. Superman/Batman? It has Loeb. The story is good, but Loeb will sell anything. Metropolis? Great story. No Superman. Birthright? Two issues in, and good, but not common, every day, continuity Superman. Man of...whups. That got canceled now, didn't it? Regular Superman? In the tubes. ...Austen wasn't interested in working on the Superman titles till he was able to makes some changes and flex his creative muscles. This didn't mean getting rid of Superman's powers and giving him shoulder pads to match his spanking new vacuum guns, but simply the chance to move the mythos forwards. So what attracted Austen to the Superman comics? "Initially? Nothing," admits Austen. "Superman is such an icon, you can't really do anything with him for fear of screwing up some licensing deal or other. Therefore, his sales are less important to the company than maintaining his 'status quo.' That can make for some pretty dull stories. You literally can't do anything to surprise people because you can't screw up what people paid lots of money for as a property outside comics. "Superman's been like that a long time. And he's the original, so he's the oldest, he's almost 70 now, isn't he? So most of the interesting stories have been done, and had been for a long time. I thought he was fairly boring when I was a kid, so I never read them then. I was a character guy, so I loved Marvel stuff. Superman was plot driven. Didn't interest me. "But I wrote a couple stories that were pretty much 'out of the box' as far as DC thinking was concerned, and it invigorated Eddie. He liked the fresh approach, and got very enthusiastic about my ideas. So he asked me 'If you were to write Superman, how would you handle it?' and I did some research. I read tons of Superman stuff, and the only work that grabbed me was the original Siegel and Shuster material. Brilliant in its charm and simplicity. I loved it. The bolds are mine. These are my points of concern. This man is Marvel, so it would seem. And while I reads me my Marvel, as do most of us, I'm firmly convinced that they are two different Universes. Why? Because I can easily see ANY character in Marvel killing someone if they got angry enough, save maybe Spider-Man. And most, I emphasize, HAVE. In DC, the idealism rules the hero roost. In Marvel, the action, the suspense, the character, and the grim realism rules the roost. My point? I give Austen and the new crew their benefit of the doubt. But do I think they will fix this problem, the one mentioned above, that this issue exemplifies? Like Loeb. Loeb was great, to me. Pure, idealistic, wonderful Superman. One "name" guy (Austen) can bring all of the title's sales up. But for all the wonderful stories that Loeb contributed, there was one thing he could NEVER do (his fault? Eddie's? Who cares. It happened) was bring the books together. One invariably sucked, generally. What do I see? One good story a month coming. If it doesn't become SuperPunisher. Art - 3: I usually like Ferry, but everything was a bit plain this issue. Superman looked, I don't know, a little different than Ferry usually portrays him. Less defined, and brighter, which was a treat. Maybe I'm so used to the dark Superman that I'm thrown when he's back to normal. But regardless, nothing jumped out, nothing glared as horrible save Superman's plainness, and it's just about normal quality...tell the story, move it along, and here we are. Cover Art - 1: No background, FAR beyond the usual amount of no background. Misrepresentational scene not shown in the issue. The lizard is pink when the lizard is green. It advertises SUPERGIRLS, as if to rub in the fact that we, the fans, are utterly sick of the super-titles taking Supergirls into and out of continuity, along with throwing new female characters around when the old ones need some character fixing (Lois, Lana, Cat Grant (is Cat even still alive?)). I suppose they figured declothing the character on the cover would seem not only artistic, but a positive boon to the average thirteen year-old seeing girls in new light for the first time, and exploit it. And here's the capper, folks. The most ridiculous, horrible, atrocious, brummagem, vagabond, egregious, nigh likeable, adjective laden insult, bogus thing I have ever seen on a Superman cover. I'm not a fifteen year old anymore. My sister runs circles around my hipness, to be sure. But I'm not so far gone in my 23 years of old age that I don't know, from the bottom of my lost heart, when an adult writer is trying too hard to hit the street lingo. Maybe it's the way Kelly actually speaks, but I'd bet the 2.25 I wasted on this that it is not. I haven't cringed seeing a cover like I did when I saw that phrase since I saw a flying gorilla on a VERY old Action Comics. It's like the recent cover to Mer-Man, a He-Man comic. Who wants to read about some Aquaman wannabe who can't even talk without gargling? This cover raised the same gourd. Who wants to read about street magic in a SUPERMAN COMIC? X-Ray vision. Leaps tall buildings. Eats bombs. Freeze breath. THIS is what we want on the cover. And then in the issue.